I am a textile designer and use fabrics to tell stories. Patricia and I teamed up to design a textile to express what EDS patients experience and how this disorder affects their lives, collaborating on a textile pattern called “Calling All Zebras.” This is our story of how health communication isn’t always with words. Years ago, I took a photo of a zebra on a trip to Kenya. She stood there looking at me, all proud and strong. So, she became the starting point of my design process. 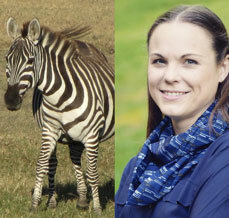 Left: Photo of zebra taken by Martina Sestakova on a 2013 trip to Kenya. Many other artists have inserted their life experiences into their art. This collaboration has been an opportunity for us to learn from each other: I listened to Patricia about her EDS experience and she embraced my ability to communicate information visually. I feel richer as an individual and as a textile designer. This collaboration has opened my eyes to causes I did not know anything about and to opportunities in my field of expertise to take these causes and raise awareness through story-telling. 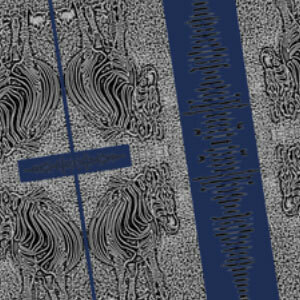 My initial idea included a digital manipulation of my photo to bring out the black and white color scheme of zebras. To capture the spirit of the EDS patients, I recorded a sound wave of the word “warrior” and added it as a visual element. The textile pattern was a repeat of zebras looking at each other reflecting the notion of being seen by each other and being part of a supportive community. 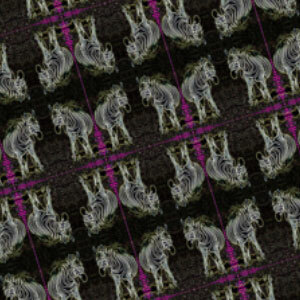 The second pattern I created got away from the traditional black-and-white zebra color scheme. 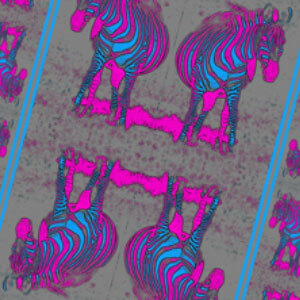 The zebra image was repeated in two different sizes and the color scheme focused on pink, blue, and gray. The idea behind this pattern was to reflect the intensity and variety of EDS experiences. The third textile pattern married several ideas: focus on black-and-white, large zebra print, and zebras looking at each other (as in building a community). I recorded a sound wave of the words “zebra strong” and inserted it all around the zebra images. ​Patricia approved of this one saying, “It looks strong to me!” And what more could I ask for as a textile designer than have her look at my work and see that it is strong, just as she is! 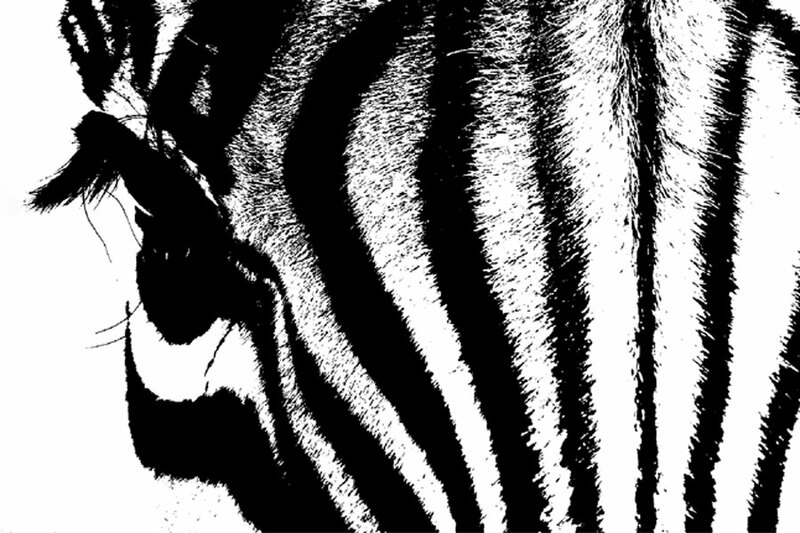 Patricia, however, voiced that the black-and-white zebra matters to the EDS community. Patients with EDS want others to know that they are “zebras”—loud and clear. This was an important piece of information for me as somebody learning about EDS and as a textile designer aiming to capture the nature of the EDS experience visually. So, we moved on. As with many other diseases and disorders, patients with EDS seek inclusion and acceptance of their experiences and condition. If you are interested in any of these textiles, email connect@radostbymartinasestakova.com. They can be turned into scarves that will be a reminder of your strength as an individual with EDS. And you will be fashionable too! Martina Sestakova has a B.A. 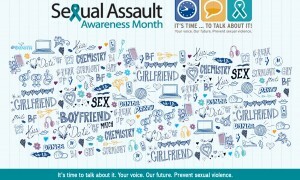 in communication from the University of Maryland. She has more than 9 years of experience in intercultural communications, in particular in multinational clinical trials. An avid traveler, Martina documents her experiences in writing. Today, she is a textile/fashion designer who runs RADOST, LLC and an artist featured at the Smithsonian American Art Museum in Washington D.C.
Patricia Stott is a physical therapist in the Denver, CO area and also happens to be a certified athletic trainer, certified hand therapist, and a certified running coach with the USATF and RRCA. 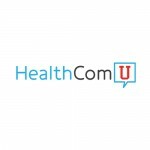 She is currently running a food and health blog when she finds some free time reaching out to those with hEDS at www.thehungryzebra.com. She likes working with all types of patients she sees in the clinic, but thoroughly enjoys working with fellow zebras to find their individual balance to make life as functional as possible.